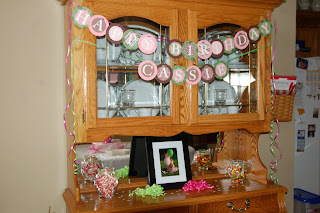 Last Saturday we celebrated Cassie's 3rd birthday cookout style. We had friends come over to party with us. We do wish our family could have been here but thank God for friends. 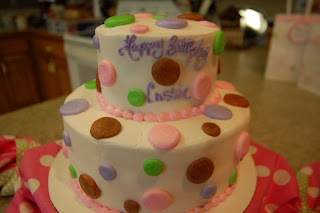 Cassie loves polka-dots so that is what I choose for her party theme. Here is a funny story. One evening Cassie saw my freckles on my arm and said "Mommy you have polka-dots." I laughed so hard I thought I would pee my pants. 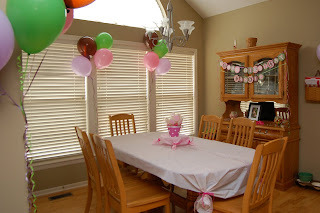 The next several pics I will show you how I incorporated polka-dots in the party decor. WARNING!!! Lots of dots!!! 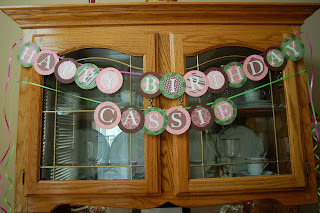 I made the birthday banner with my Stampin' Up cardstock, papers and die-cuts. I had so much fun making it and I think it turned out pretty cute!! 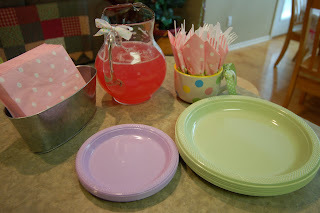 I also had different candies set around the party space with circles or dots in mind. On the china cabinet I had a bowls of skittles and smarties. I found this idea on-line. 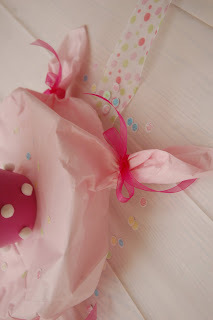 Actually I found a lot of my ideas on-line at Polka Dot Birthday Party Ideas blog. 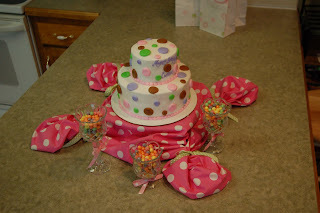 I never dreamed about doing a party in polka-dots till I found this website. Thanks for all the ideas. This is a tarra cotta pot that I painted pink and glued on white fuzzy balls. I had the ladybug cookies made by Laura Poland. 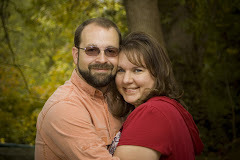 (click on her name to go to her website) She was one of the mom's from Aundrea's kindergarten and 1st grade classes. She did an AWESOME job!! The cookies tasted SUPER yummy and they went perfect with the polka-dot theme. I don't know what happened with this pic being sideways. 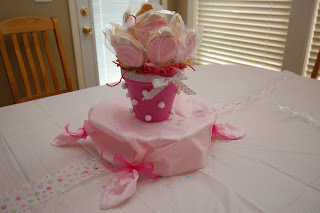 I used a cake plate to sit the pot of cookies on and used tissue paper and bows to cover the plate. The dots you see are from wrapping paper that my sister used to wrap Cassie's gifts in. I used one of my punches to punch out the dots and used them around all my decor. You can't tell in pic but the dots are covered in glitter. They looked very pretty in person. I bought lots and I mean LOTS of ribbon to use through out the party space. 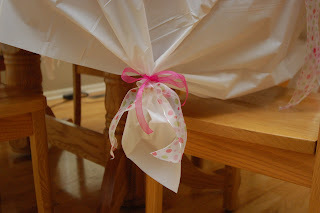 Here I gathered up the corners of the plastic table cloth to dress it up. This cake was Soooooo delish! !, and it looks Fabulous!!! I went to my local grocery store bakery and told them what I wanted and this is what they came up with. SWEET!!! I bought the fabric to cover one of my wood risers to raise up the cake for dimension, and of course, tie up the corners with, what else, but polka-dot ribbon. And more dot candies. These were sweet tarts and they were the biggest hit. Eatable decor what more can you ask 4!! Ha, I'm a poet!! He! He! 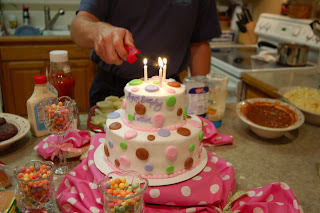 Here is the cake with the candles on it. My camera died just as Cassie was blowing them out so this is the only pic with the candles lit. Unfortunately, it was raining so we did grill out hamburgers and hot dogs outside but ate inside. Even though we had a great time. Let me just share this drink we had. Take frozen pink lemonade and add 7-up instead of water. Very refreshing!! Thought I was done the the dots? Not yet. 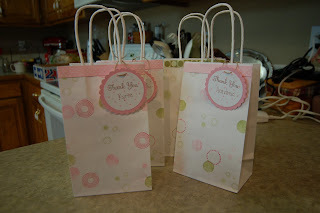 I used my dots stamps sets that I have to stamp these party bags to give to the kids. We only 4 total including Aundrea so I didn't have to make many but they were easy to make and they turned out cute. Here are our goofy girls. 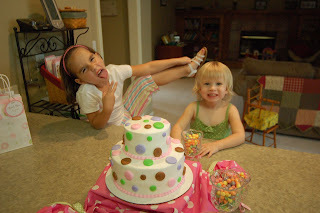 They could not wait to dig into the cake and they would not keep out of the candy either. We had to fight them off with a stick to keep the away. Just kidding!! about the stick part!! Well, are you seeing spots yet? I hope you enjoyed looking at the party docorations because I had fun making them. Now I am seeing nothing but Polka-Dots!!! At least I know it's not my bad eye sight. Melissa everything looked so cute, sorry we could not be there. Wait till we retire!! Happy Birthday Cassie, we love you. Oh my goodness!! I already knew you were creative, but you outdid yourself. Everything was so cute! I love pink and white so it was right up my alley. I am sure Cassie loved it all. So clever!!! And just darling!!! I can tell they enjoyed the party. Give the girls a hug from Mama and Papa!